Home eXtreme botany An eXtreme Botanical Corker! Dr M was today totally bowled over and utterly charmed by a truly massive Cork Oak (Quercus suber) at Standish Hospital, in Gloucestershire. 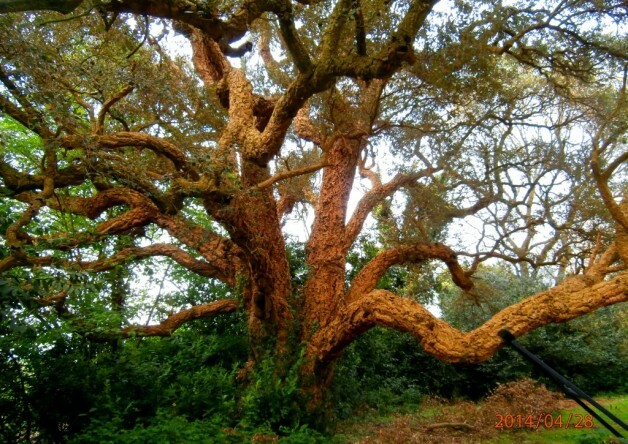 With a girth of nearly 6 metres (18 feet) and a height of 21 m (over 60 feet), and around a dozen massive limbs this is indeed a monumental tree and one of the largest Cork Oaks in Britain today. Cork Oak is a native of the Mediterranean and North Africa, and is precisely the tree which has provided the cork for floor and wall tiles, and for wine bottles for centuries (before the plastic took over!). In its native range, the Cork Oak tree is a crucial component of traditionally managed Mediterranean landscapes known as “agro-silvo-pastoral ecosystems“. Quite a mouthful, but the three-part name refers to landscapes which have been actively managed for centuries for low-intensity arable cropping (the agro-bit), for timber and cork production (the silvo-bit) and for grazing (the pastoral bit) by animals such as pigs, cattle sheep and goats). These are truly multi-functional landscapes, and the diversity of low-intensity management is reflected in the richness of wild plant and animal species creating biodiversity hot spots of great conservation value. The Standish Hospital Cork Oak was planted way back when and, lovely though the Gloucestershire countryside is, the tree is somewhat divorced from its natural habitat! However, it is truly magnificent plant and one which cannot fail to inspire for the wonder of great trees! It seems a shame natural corks are being replaced by plastic, is this just because plastic is cheaper and easier?